the provincial government began offering the residents of the outports resettlement money (currently the offer is up to $270,000 per landowner) if 90% of the population agreed to shut down the village and move. Poignant photos hanging in several heritage museums show fishermen towing their homes across the water to their new communities after the first resettlement deals were struck. Though most of the resettlements transpired between 1954 and 1975, the provincial government has made new pushes for resettlement after the cod moratorium in 1992. Today only a small number of outports remain and I was determined to visit a few before they disappear forever. We just had a week for Newfoundland this time and so chose two tiny communities in the central region to serve as our home bases for exploring. I was excited to fly into Gander, the tiny international airport where my mother’s plane touched down to refuel on her first flight to North America when she emigrated to the US after WWII. She had described her awe at seeing virgin wilderness for the first time. And awesome it was! As the plane crossed over the land mass of Central Newfoundland I did not see one house or road across the great expanse of spongy land. A three hour drive brought us to to our first destination, the tiny community of Coffee Cove, a half hour beyond the “big” town of Springdale (population 2,900). The three ring info binder we found in our lodging described Springdale as having “everything we could possibly need”. We could not tell if that was said in seriousness or jest. Our first test of this statement came as we went hunting for food supplies to bring to our lodging. We had unwittingly arrived on Canada Day and the two grocery stores in Springdale were closed. So we shopped for dinner at the gas station. We had been told we could get home made pizza there, which sounded promising enough. When we discovered the one pizza on offer was bologna pizza we settled instead for the last dozen eggs in the fridge and and a box of crackers. A trip to Newfoundland can serve as a healthy reminder of the difference between “need” and “want”. Four or five homes grace Coffee Cove. We were super lucky to have secured lodging in the beautifully renovated 150 year old “Baker House“, which we thought was the perfect size for the two of us. We spent a lot of time pondering the Baker’s sleeping arrangements when we learned they had populated this house (without the back addition) in the 1800’s with 11 of the own children plus another adopted two. We arrived the first week of July, the last pretty reliable week for iceberg viewing. The annual parade of ice sculptures makes its way down to Newfoundland from Greenland along what’s called “iceberg alley” the north east coast of the province. We caught a ride in the boat of King’s Point fire chief and back country outfitter, Barry Strickland, to get a close up look at a couple bergs that had grounded nearby. Barry cut the motor as we got close so we could listen up for the warning crack or boom that signaled a “calving” which meant “SCRAM!” Barry showed Dave how to run the boat in case he was thrown overboard with the ensuing tidal wave. Hmmm. I doubted very much that we’d be the ones left on board. Finding a small berg that was safe enough to mosey up to Barry “harvested” a chunk of the 10,000 year old compacted ice. You can nurse a drink an entire evening with one very slow melting chunk. From the boat Barry pointed out Joshua Tom’s General Store in the settlement of Rattling Brook. He recommended a visit there to meet Dulcie, who has a gift of the gab. Dulcie, now in her 90’s, I believe, has been stocking shelves and running Joshua Tom’s (her deceased husband) store for nearly 70 years. Dulcie is particularly proud of her supply of fabric. I was most intrigued by the prevalence of Christmas supplies that can be found throughout the store. I could not decide if this meant that the Christmas paraphernalia was the most or least sought after of her supplies. If Canada is looking for someone who embodies optimism, warmth, and open-mindedness, a symbol for Newfoundland’s resilience, I nominate Dulcie! Dulcie was very excited by the unlimited minutes on her phone plan and offered to call us once we got home to see how the trip went. The Baie Verte Peninsula is ringed with tiny outport communities. Blustery wet weather only allowed visits to a few, and we started to question the wisdom of even those few as we bumped along long dirt roads crossing paths with no other vehicles. (Our Budget rental car will not break down, right?) Luckily we were told in advance not to even think about taking a vehicle down the treacherous descent into Round Harbor (not to be confused with Harbor Round on the northwest side of the same peninsula). The gravel plummets to the cove and then that’s the end of roads for Round Harbor. Homes are accessed either by paths or by water. We saw one house in Round Harbor which appeared to still be inhabited. Probably one of the Fudges, the last family in Round Harbor. Signs of a recent fire in Round Harbor were particularly distressing to see as it is obvious that once a fire breaks out in such a forsaken outport, there’s no one who can come to help contain it. I understand that Mr. Fudge was a crab fisherman. Sadly we saw crab traps in among the fire debris. If this is possible, an even more desolate spot is to be found a couple dirt roads over: the nearly abandoned settlement of Tilt Cove. Unlike every other settlement we visited whose history was tied to fishing, Tilt Cove was a copper mining town, which in its “boom “days, had a population of 2,000. When Tilt Cove faced its second and final mine closure in 1967, all but 50 residents moved away. We couldn’t have picked a drearier day to visit. As we traveled the last stretch of the long mud and gravel road into town we had the impression of descending into a crater. At first we saw no signs of life. But then half way around the pond we saw a flag hanging limply at one well kept home with a little shed beside it marked, “The Way We Were Museum”. Within seconds of stopping our car Margaret Collins popped out of her home to greet us. Turns out that Margaret, besides being the town clerk and wife of the town’s mayor, is the great, great, great granddaughter of the founder of Tilt Cove, George Winsor. Most importantly, Margaret Collins is keeper of the flame of Tilt Cove. She has saved and organized every image and scrap of information on Tilt Cove. For years she and her husband harbored hopes that Tilt Cove would rise from its ashes. She pointed to a photograph of a crowd of RV’s surrounding the town pond for a Tilt Cove Reunion about fifteen years ago. It suggested to her and her husband that folks did really want to come back. But, in truth they never did come back and one by one the town’s population has dwindled to the current population of four. With Margaret’s wistfulness weighing heavily upon us we drove out of the Tilt Cove crater and down another long, muddy road to the slightly less abandoned settlement of Shoe Cove. A few of the old houses with boat-only access which typify original outport dwellings still stand in Shoe Cove. Our final destination this trip: Little Bay Islands which I had read about a couple years ago in my search for Newfoundland island communities still serviced by government ferries. Little Bay Islands, with a year-round population of 47, has been in the midst of a contentious resettlement vote for the past couple years. I came to understand that if I wanted to visit, it had to be NOW as the town’s future is jeopardy. The most recent vote, last November, brought the percentage in favor of resettlement to 89.47%. That’s just one vote short of what’s required–a 90% vote– to approve the shut down of the town. It’s a contentious and painful situation to be sure. The irony is how much the residents love Little Bay Islands. And there’s much to love, first and foremost the serenity and natural beauty. But there’s no denying it–it’s hard to make a go of it in a community that has no commerce of any kind–no stores, no gas stations–just a tiny little self serve laundromat with a jar to tuck your dollars in for the use of the washer and dryer. Oh yeah–you can throw in a couple of Loonies or Toonies for a bag of potato chips and a soda–and wait for it–iceberg chips if someone’s gone harvesting! The fish processing plant closed a few years ago–a death knell for the island, for sure. who turned a sow’s ear into a silk purse when her full house of guests got stranded on the island. Sharlene dug down deep into her freezer reserves to feed us and broke out the “Screech” to loosen the table talk. To make our meal complete one of the island’s year-round residents donated the very last jar of pickles that she had squirreled away in her pantry. That’s the outport way– share what you have and make do. What got us stranded? Well first a cable broke on the ferry’s on/off ramp, grounding the ferry for a day. No problem–we had an extra day built into our schedule before our flight home . (You never know, I had said–it’s a island after all…) Then the next day a Nor’easter whipped up. On the ferry’s first run after the cable had been replaced she crashed into the dock tearing a hole in her hull despite this generous lineup of tire bumpers. Ouch! There went our extra day in our itinerary as each scheduled run of the ferry was cancelled. Gloria’s first hooked rug showing a very accurate image of her Little Bay Islands home and her boat, “Chummy T’ing”. The day before the Nor’easter swept in we hopped on board “Chummy T’ing” to circumnavigate the islands under the helmsmanship of Gloria’s husband, Maurice. As the Circle of friends was wrapping up, Doris (in lavender, above, who, BTW, was the donor of the precious dinner pickles) asked if the “foreigners” had signed the Circle log book. I didn’t blink an eye at this, but Eileen who hailed from Vancouver, whispered to me, “Well, that’s the first time I’ve been called a foreigner in my own country!” But truly, in the outport of Little Bay Islands we were all what’s know in Newfoundland as “come from aways”, which is really the same as foreigners. And having just bathed in the warmth of this wonderful Circle of Friends, we knew this was Newfoundland humor rather than a barb. 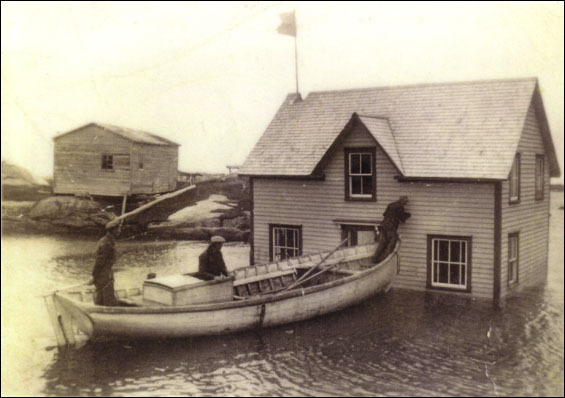 We arrived back at Aunt Edna’s to learn that the ferry hull had been repaired but that she (yes, all boats are female in Newfoundland) couldn’t take any passengers until the inspector could get there the next morning to witness a “dry” (??) run. Oy! Sharlene served us the biggest breakfast in the history of B and B’s the next morning. No doubt she had a theory that calories would quell our nerves. Our window of time to get to the Gander airport was narrowing. If they could just complete that damn dry run before 10 AM we could conceivably get to Gander for our afternoon flight. And as long as there was even a remote possibility of this, by golly, Sharlene was going to exert all her powers to make that happen. She turned her kitchen into ground control. She got on the phone and quickly made her way up the chain of command with the ferry authorities. I was half expecting her to dial Prime Minister Trudeau and tell him to get on down to the dock and inspect the vessel himself. Meanwhile the other guests, who could see the writing on the wall as clearly as we could, that we were going to miss our flights, whipped out their laptops and tablets and started putting together intricate new travel itineraries for us. By the time we boarded the ferry around noon, Dave and I were resigned not only to having missed our flights but to incurring an additional cost of $1200 to book our new flights. We arrived at the Gander airport an hour after our original flight departed–no surprise there. BUT, you can imagine our delight when the nice, nice Air Canada representative at the ticket counter said, “no charge” as he re-booked our flights to depart the next morning. When I told him I’d been quoted $1200 by the Air Canada agent on the phone he furrowed his brow and then broke into a smile, replying, “Well, that’s not the Newfoundland way!” The hole in the ferry hull wasn’t your fault, why would you have to pay for that, he asked. In case you need any more enticements for flying in and out of the Gander airport, besides their awesome ticket counter guy, how ’bout this rush hour image of the Gander security line. Made me understand why both the hotel clerk and the cab driver looked quizzically at us when we said we needed to arrive at the airport two hours before our international flight. “One hour in advance should be more than enough”, they counseled. Ah…ya! I’d say that 15 minutes would be perfectly safe. PS If you need a little something uplifting and inspiring in your week of dreadful news stories (and who doesn’t? ), click onto this link for the wonderful story of how the entire town on Gander came to the rescue stranded air travelers on 9/11/2001.